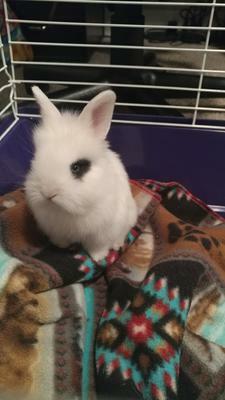 I just got my female rabbit from someone who has no idea what kind of rabbit she is, I'm thinking she must have some lionhead in her, but from other pictures she doesn't seem to match. I'm mostly wondering because lionheads require some more care for their fur, and I need to know if I need to be worried about that. I have looked at your picture and you can see that the hair from forehead to noise and cheeks are not a smooth as in the Netherland Dwarf bread. Do think that you do have a mix of Lion head and could be mixed w/ Netherland. But you can tell that she is not an all Lion Head rabbit. Do have a Dwarf Lion head and Mini Lop. Have seen Lion Heads with full main and short hair on the rest of the body and I have one w/ shot hair around cheeks, Long main and med. hair on rest of the body. She may be mixed w/ a long haired bread, don't know?! Your cute little Doe sure looks like a Netherland Dwarf! I had on she was 1.9 pounds they can reach up to 5 pounds. She’s too cute!